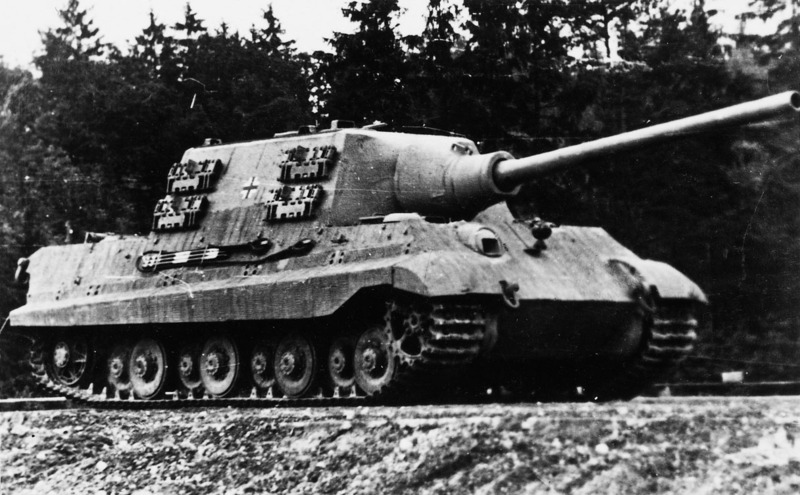 Introduced to service during February 1944 and otherwise known as the Panzerjäger Tiger Ausf B für 12.8cm PaK 44, the six-man Jagdtiger (hunting tiger) was the last word in the German Army’s search for a tank hunter/destroyer capable of destroying with a single hit any tank fielded or likely to be fielded by the Allied powers. The Jagdtiger was based on the chassis of the standard Tiger Ausf B (Royal Tiger) with a lengthened suspension and the turret replaced by a massive welded superstructure constituting a virtually impenetrable barbette or fighting compartment. The front of the superstructure was a single piece of cast-steel armour 250mm (9.84in) in thickness and sloped back only 15° from the vertical, and in the centre of this front plate was the 12.8cm PaK 44 gun with a massive cast mantlet to protect the aperture in the front plate. The side plates were interlocked with the front and rear plates, and entry to the barbette was effected by means of a hatch with double doors. Provided with 38 anti-tank rounds of the separate-loading type, the gun was electrically fired and had a breech block of the vertical sliding type. This gun had an elevation arc between -7.5° to +15°, and could be traversed 10° left and right of the centreline. However, there were never enough to make a difference on the battlefield.